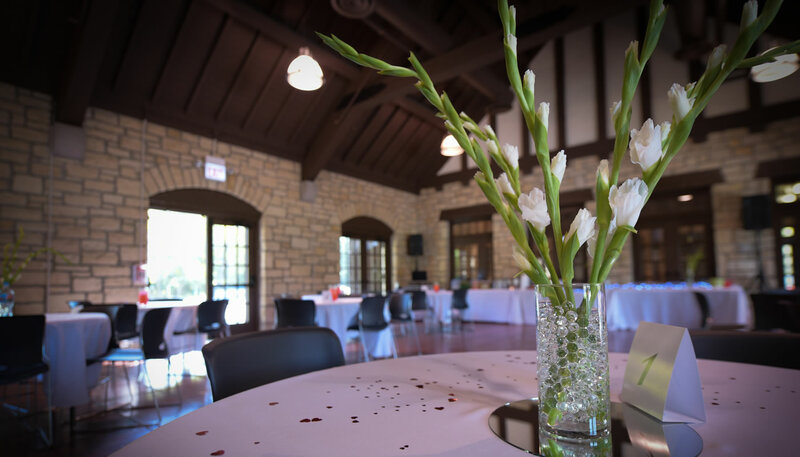 Nestled in serene forests in Chicago and the suburbs, the Forest Preserves of Cook County indoor event venues offer scenic views and beautiful spaces for your next event. Versatility is the key word for the Dan Ryan Woods Pavilion. The wide open design can be arranged to suit a variety of affairs, functions and occasions. This pavilion can accommodate approximately 120 guests and is perfect for your next banquet, meeting, seminar, luncheon or reception. Additionally, the Dan Ryan Woods Pavilion has a smartly designed kitchen for light food preparation. The LEED-Platinum certified building includes a large meeting/event space that accommodates up to 80 guests and a smaller room for meetings that seats 20. Both rooms have easy access to the outdoor patio area on the ground level and a deck that overlooks a scenic lake offering a beautiful view. This facility is an enjoyable meeting location and can be rented out for private parties, weddings, birthdays, communions, baptismal and organizational meetings. In addition to the wood-burning brick fireplace, the 40-person pavilion features a kitchen prep area, refrigerator/freezer and restrooms. The floor-to-ceiling windows on either side of the building open completely to allow a cool breeze or create an amazing indoor/outdoor experience. *Shared patio is not part of rental space, the building does not feature air conditioning and parking is on a first-come, first-served basis. This event venue is anchored by a stone masonry traditional gas-lit fireplace which adds richness to the restoration of the entire facility. Two meeting rooms can be used either as a single space or two separate functions, which can accommodate approximately 120 or 80/40 guests accordingly. A convenient prep-type kitchen is on-site. The Forest Preserves’ Volunteer Resource Center (The VRC) has long been an enjoyable meeting location and can be rented out for private parties, weddings, birthdays, communions, baptismal, and organizational meetings. It features an amply spaced room with a stage and an outdoor stone patio separated by a row of classic French doors. This room can accommodate up to 100 guests and has a smaller class room (40 guests) nearby which can be configured for a variety of uses as well. This space is accented by beautiful high-wooden ceilings, superb acoustics and wood burning fireplace and is hidden in the Forest Preserves of Cook County overlooking the Edgebrook golf course.